Cook the quinoa according to package directions, using stock or water. Let cool completely. 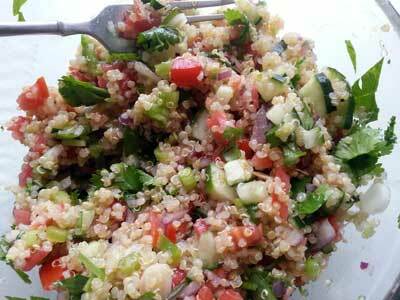 In a large bowl, combine the cooled quinoa with the remaining ingredients. Toss to mix thoroughly. Quinoa was important to the diet of pre-Columbian Andean civilizations. Today the tasty grain (although not technically a grain) has been called a superfood and is available in health food stores.